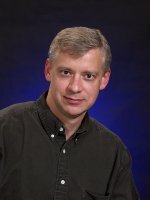 Congratulations to Pacific Northwest National Laboratory's Dr. Jerome Fast on his appointment as an affiliate scientist for the National Center for Atmospheric Research (NCAR) in Boulder, Colorado. The University Corporation for Atmospheric Research Board of Trustees appointed Fast to the three-year position starting November 1, 2009. As part of his appointment, Jerome will work in Boulder for at least three months, collaborating with scientists in the Atmospheric Chemistry Division of NCAR on aerosol modeling projects. He will coordinate the implementation of improved representations of secondary organic aerosols in models and how they are evaluated using field measurements. Other research will include coordinating the implementation of new process modules developed by PNNL and NCAR staff into the community Weather Research and Forecasting model. NCAR is known worldwide as one of the premiere centers for improving the understanding of atmospheric and Earth system processes. Only a select number of scientists are appointed to the prestigious position of affiliate scientist there. PNNL's Dr. Ruby Leung also serves as an NCAR affiliate scientist.